Ok so not everyone knows what an Anonymous Email is. We have taken a screen shot image of an example to show you. In a nut shell, with an Anonymous Email the main point is 'you can edit the FROM address shown to the recipient' Some people call Anonymous Email, Spoof Email or Fake Email. Any Email sent does not contain any information that can identify you. Your computers IP address and ISP information is totally removed to protect your anonymity. What ever email address you send the email from you can still receive the reply in your personal inbox. Alternatively deactivate the reply option so any reply sent goes to the email address the email was sent from. 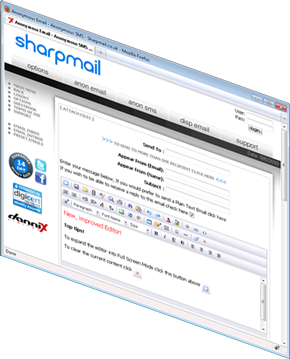 With Sharpmail's Anonymous Email we have added extra Anonymous Email tools so you can compose your Anonymous Email quickly, with ease. You can insert images, manipulate text to make it bold, italic, underlined and change the font colour or font face. You can attach files and insert images to name a few. This is all done using our exclusive Rich Text Editor (RT EDITOR). 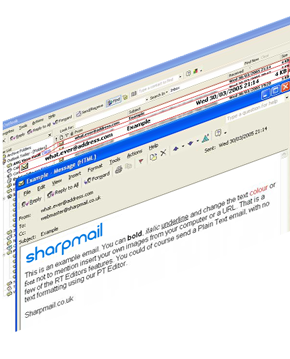 If you don't want to make your email look fancy, or simply can't be bothered, you can use a Plain Text Editor (we call it PT EDITOR) for true simplicity.